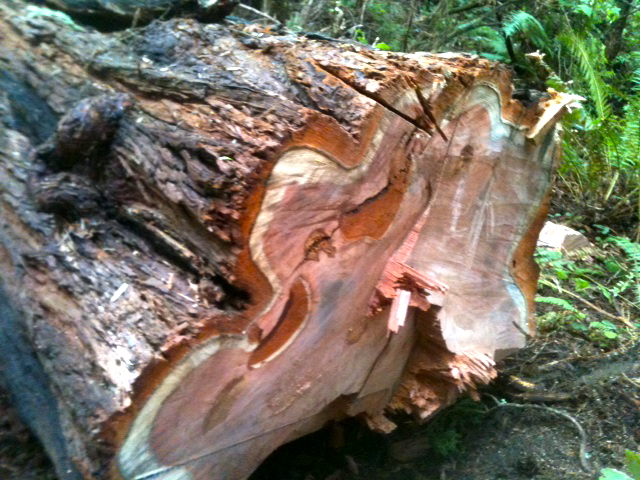 The slaughtered old growth redwood. USFS photos. CRESCENT CITY – Sometime during the night and early morning of March 16 to March 17, 2013, a large old-growth redwood tree was cut down illegally at Redwood National and State Parks in the Prairie Creek Redwoods State Park unit. Most Americans would be appalled to learn that a part of their national or state heritage had been stolen, whether a piece of the Statue of Liberty’s crown, gravestones from Gettysburg Battlefield, or a painting from a California mission. Yet this very thing is happening right in our backyard. The destroyed tree was approximately 300 years old and healthy before it was cut—destined to live 2,000 years. 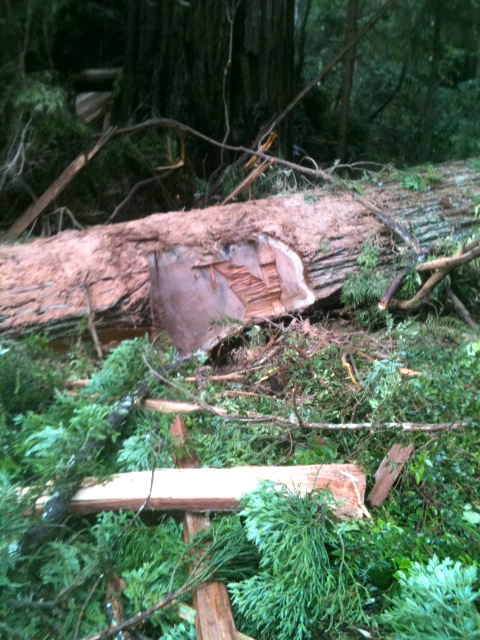 It appears that the tree was cut down in order to get to a large burl which was 50 feet up in the tree. 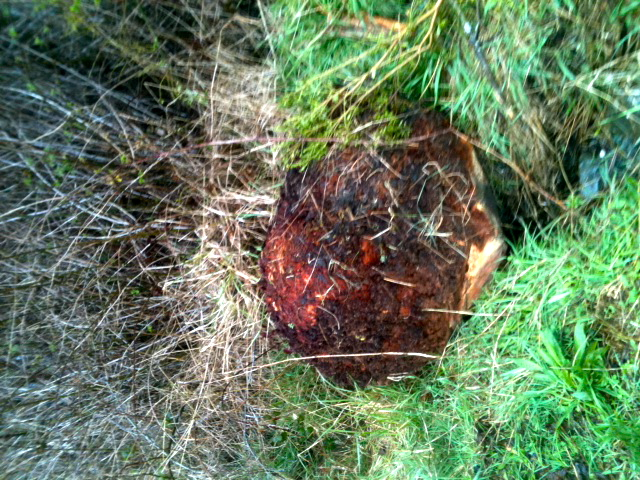 Once the tree was down, the burl was cut off and hauled away. Like the Statue of Liberty and Gettysburg Battlefield, the redwood forest is a national and state park belonging to all the people of the United States and California. Each time a piece of the park is stolen—whether a burl, a tree, or an archeological artifact—the thieves are stealing directly from the people of the United States and from our national legacy to the future. Of the approximately 2.5 million acres of old-growth redwood forest that existed in the last few centuries, only four percent remains, half of which is in Redwood National and State Parks. The remaining forest is cherished by people around the world. In fact, Redwood National and State Parks were designated a World Heritage site in 1982. Not only is damaging and stealing any part of this heritage taking from our future generations, it is a criminal offense punishable by fine and incarceration. Anyone having information regarding this crime please contact Ranger Danielle Westberg at (707) 465-7345. A reward of $500 is offered for information which directly leads to the arrest of the offenders. This entry was posted on Friday, April 5th, 2013 at 5:24 pm	and is filed under News, Environment. You can follow any responses to this entry through the RSS 2.0 feed.